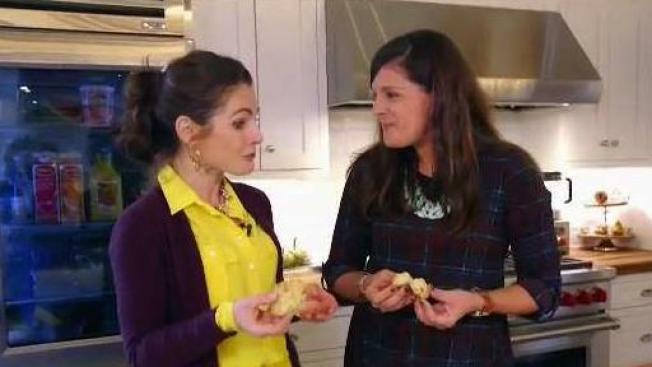 The Hub Today's Anna Rossi cooks up delicious cheddar scallion biscuits with Hub viewer Sarah Olson. Preheat oven to 425. Whisk together dry ingredients: Flour, Baking Powder and Salt. Using a pastry blender or two knives, cut Butter into dry ingredients. Cut in until large crumbs are about the size of a pea and the rest look like fine breadcrumbs. (This will ensure flaky biscuits instead of fluffy which is good for plain biscuits, but with the cheddar and scallions in this recipe, a flaky texture is best). Add in Cheddar, Parmesan & Scallions. Add milk and mix with a spatula until dry ingredients are just moistened. Do not over mix. Using two large soup spoons, form golf ball sized scoops of batter - then drop onto ungreased cookie sheets. Bake until the bottoms brown, about 10-12 mins. Serve hot with softened butter. 'Tis the season for holiday traditions and heirloom family recipes. The Hub Today wants to showcase yours during our month-long #HubHolidays festivities. Just email a photo of your holiday tradition or recipe to hubtoday@nbcboston.com or share it with us on social media using the hashtag #hubholidays. You could be selected to re-create it all on air with The Hub Today's Anna Rossi.